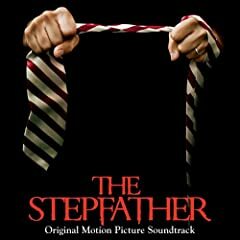 The soundtrack for the new horror/thriller The Stepfather bursts out it’s opening notes (Mutemath’s “Typical”) like it’s a soundtrack with something to prove. It’s an unfortunate opening, especially since the rest of the album (excepting Blurtonia’s “Never Less Than Perfect” and C’Mon’s “Safer When”) is mostly made up of darkly depressive alt-rock bitter-ballads, rather than the more nasally punk-rock whining displayed in the opening track. (As an aside, Lightning Swords of Death’s “Platinum Camelot” is in a metal category of it’s own on this album and could also have been left out of this compilation). So, minus the four tracks mentioned above, this leaves nine solid selections that manage to hold their own, with Seether’s “Given” taking the prize for best song (with Hoobastank’s “Say the Same” coming in a close second). Like most soundtracks, though, this collection of music serves to capture the general mood of the film. And with the dark themes that run throughout this film, particularly considering that the assumed villain is the wicked titular stepfather, this album has dark and brooding teen angst laced throughout its 44 minutes. And though that angst takes different forms, from drooping melancholy in Drew Smith’s melodic “Melee” to the aforementioned metal screeching of “Platinum Camelot.” Even the seemingly light-hearted tones of “Eternal Summer” – a track from Red Means Go – have an underlying sense of teen boredom driving the progression of the music. Overall, this is a collection of music that didn’t do much for me. Â Even Filter’s eerie cover of “Happy Together” falls short of being memorable, instead feeling slightly forced and a bit unnecessary. Though the film opened in fifth place this weekend with a respectable $11.6 million for a film with little star power, it’s doubtful that the soundtrack had much to do with the box office haul. Band’s included are Mutemath, Sleep Detectives, Hoobastank, Feersum Ennjin, Drew Smith, Ken Andrews, Blurtonia, Red Means Go, C’Mon, Lightning Swords of Death, Seether, and Filter. No user commented in " Music Review: The Stepfather Original Motion Picture Soundtrack "